Every UX professional feels the pain that has driven me down my winding career path, but the next steps aren’t obvious and there is not a clear path to follow. I’m trying to document the opportunities that I see, in the hope that others will drive forward, taking risks in order to have a larger impact. Admittedly, I miss the days where I spent 10 hours in Photoshop or wrangling code. When I’m finalizing budgets, dealing with internal politics, reviewing contracts or defending a product roadmap, I seriously think about returning to those roles. Those challenges are much more familiar. The role far more comfortable. The results of my effort easier to see. But my influence would be dissipated. My view of the world narrowed. My ability to deliver a great experience reduced, hampered by the decisions of others. I would not make the impact that I want. It took me a long time to realize that my reason is simpler than my lengthy replies, outlining a cycle where I gained more control over the experience with each move, only to find that I didn’t have the final say. There was always someone else who would make the call, or could change something that I felt was in the best interest of the user. Now, my answer boils down to this: I want the best possible experience for our users, and the only way to do that is to be the person who makes the final decision. Many companies say user experience is critical, but until there are more of us in true, company-wide leadership roles, UX will not have its proper place at the table. 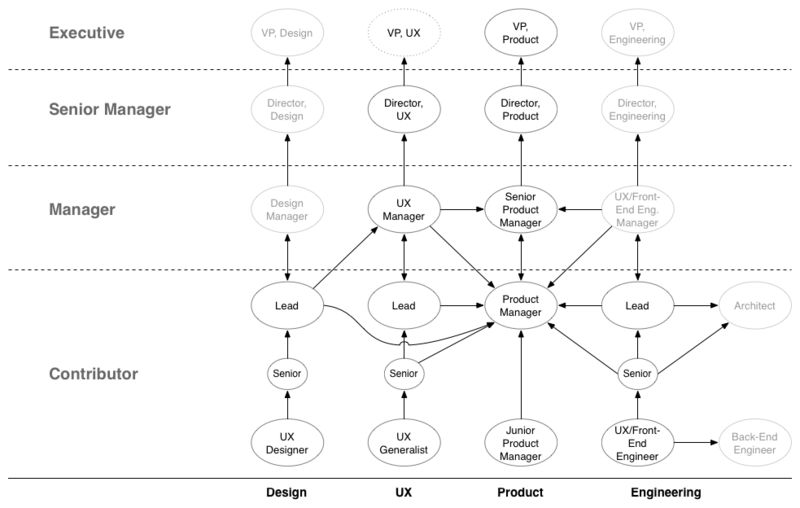 This entry supersedes my earlier post laying out my take on the career possibilities for UX professionals. With this, I aim to shed light on the differences between the options, the responsibilities of the positions and the steps needed to transition from one role to the next. This post remained a draft for far too long, held there by my hope that I would find time to fill in all of the job responsibilities specific to the PM and UX roles. I lay out four major levels: the Individual Contributor, the Manager, the Senior Manager and the Executive, which I acknowldege is far from exhaustive. There are steps between and within these levels, which aren’t included and there are branches into independent contractor roles as well as design and engineering paths that go unrepresented. Instead of waiting for everything to come together, I’m publishing this as a starting point for us to discuss the possibilities and realities of the industry. I would love your feedback and look forward to a wide-ranging discussion.